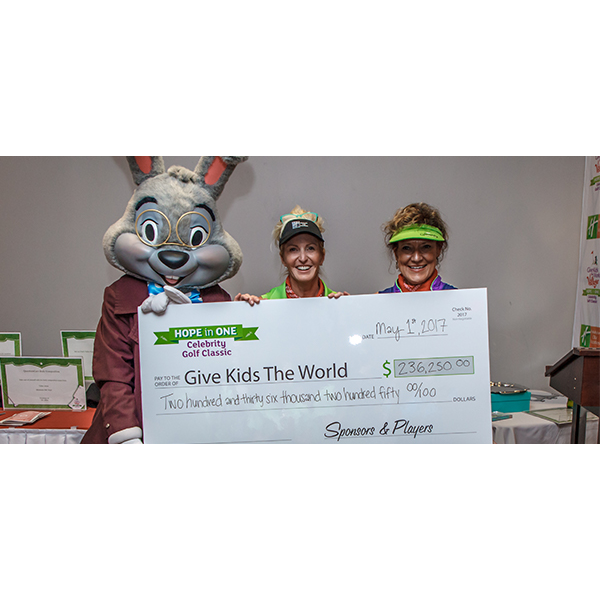 May 5, 2017 – The inaugural Give Kids The World Hope In One Celebrity Golf Classic presented by Holiday Inn Club Vacations raised more than $236,000 to benefit the nonprofit resort that makes dreams come true for children with life-threatening illnesses and their families. Nearly 160 golfers teed it up on Monday at The Golden Bear Club, a Jack Nicklaus signature course, located at Keene’s Point in Windermere for a fun-filled day of golf, food and games with celebrities from sports and music. Golfers received a fun and fanciful send-off as they drove golf carts past characters from the whimsical Village in Kissimmee. The amount raised for GKTW came from local and national businesses and caring people living in the community through sponsorships, foursome fees, drawings, and live and silent auctions. The event was spearheaded by Stacey Sutherland, vice president of Corporate Communications and Brand Services, Holiday Inn Club Vacations and a Give Kids The World Village board member, bringing attention to GKTW’s mission by bringing in new champions to support the charitable organization. In addition to Holiday Inn Club Vacations as presenting sponsor, Regency Furniture International participated as a platinum sponsor and PepsiCo donated the majority of beverages and snacks. More than a dozen local and national companies also sponsored the event. Joining the players on the greens were more than 28 celebrities such as professional golfers Richy Werenski, Ryann O’Toole, Jan Stephenson, Robert Gamez, and PGA tour coach Sean Foley; former professional baseball players Johnny Damon and Ray Lankford; musicians Kevin Antunes, Charlie Huhn, and country singer/songwriter Rob West. “The Hope In One golf tourney was one of the best. The food, gifts and games were top notch. I can’t believe this was year one,” commented Ray Lankford, former professional baseball player. “It’s so amazing that this tournament raised hundreds of thousands of dollars for GKTW. What an awesome event,” said Shawn Sharma, Universal Studios Orlando. “Wow, Wow, Wow. The tournament was amazing. Hats off to a first time tournament with first-class fun, all the while delivering a large check for what really matters – Give Kids The World,” said Shane Croft, Croft Real Estate Services. Give Kids The World Village provides entirely free vacations to children with life-threatening illnesses and their families at a storybook resort in Kissimmee. The organization relies on donations from partners, individuals and many volunteers to make magic, and give families time away from doctors and hospitals to just have fun. Give Kids The World Village makes wishes and dreams come true for thousands of children with life-threatening illnesses and their families each year. The 79-acre, nonprofit “storybook” resort in Kissimmee, Fla., is built for children, featuring a magical castle, 168 whimsical accommodations and fully-accessible playgrounds, pools and rides. GKTW resort is where nearly 240 partnering wish-granting organizations around the world send children whose wish is to visit Central Florida’s beloved theme parks and attractions. GKTW has welcomed more than 152,000 families from all 50 states and 76 countries since 1986. The resort relies on the generosity of corporate partners, individual donors and an army of volunteers to help make wishes come true for nearly 8,000 children and families each year. Their entirely free vacation also includes donated theme park tickets, meals and entertainment for all members of the family.